European Cheese Raclette Party that would Melt Your Heart ! We had a chance to learn about the art of melting cheeses and it's delicious side effects with Chef Pierre Gay. The expert from France shared his extensive knowledge on European cheese through a Raclette party. Raclette is a cheese made of cow's milk that has been broiled or melted under direct heat until oozy and a bit crispy which is usually scraped over potatoes, crunchy vegetables or cured meats. Here's a secret.. you can pretty much use any high quality cheese to suits a dish. From Blue to Brie its up to to you to mix and match and have fun with the flavors. 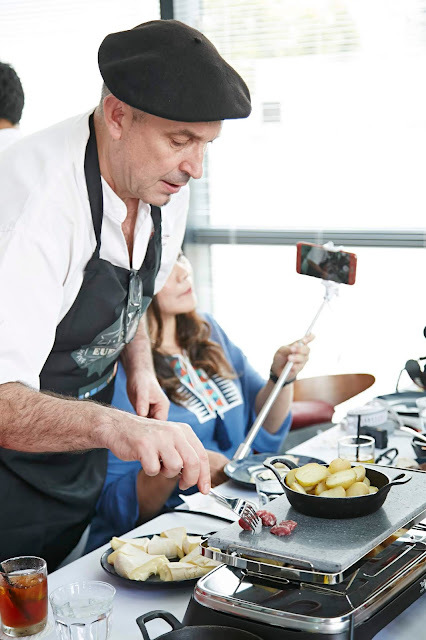 But for a perfectly gooey flavorful finish Chef Pierre suggests a good version Raclette cheese, the reason being it carries a pungent yet savory taste and a pH level that gives it the perfect melting point resulting in a molten liquid that is stringy and holds its shape at the same time. Raclette cheese can be paired with various cooked and raw vegetable such as Sliced Fresh Pepper, Button Mushroom, Tomatoes, Corn Kernels, Sliced Green Onions, Pineapple, Baked Potatoes, Cooked Carrots & Peas, Sliced Conference Pears, Sliced Green Apples and Seedless Grapes along with different meats including lamb, beef bacon, smoked chicken and sausages. The tantalizing spread also featured baguette bread, trimmings such as silverskin onions, gherkins/cornichons and spices such as pepper, salt and chilli flakes. Sounds "cheesyyy" & mouth-watering? 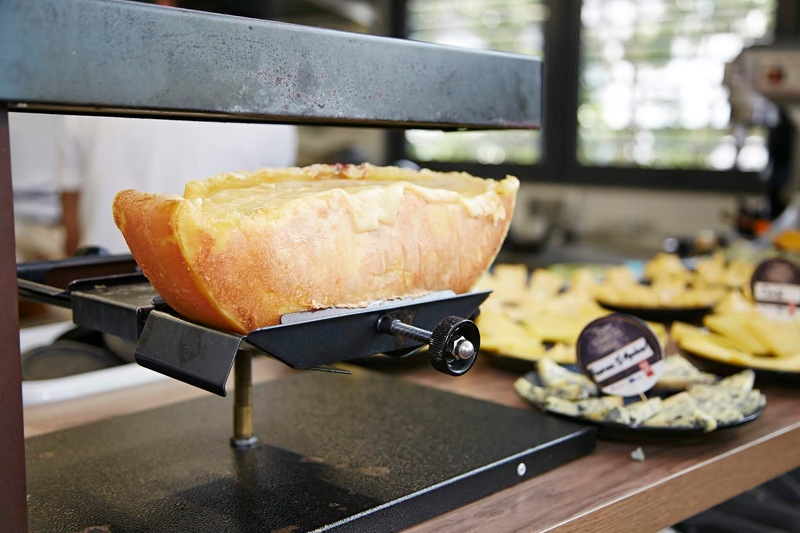 Get some European cheese from your nearest supermarket and you can easily recreate your very own Raclette Party at home to be enjoyed with friends and family....!